Update: This giveaway ended on June 2nd, 2015. 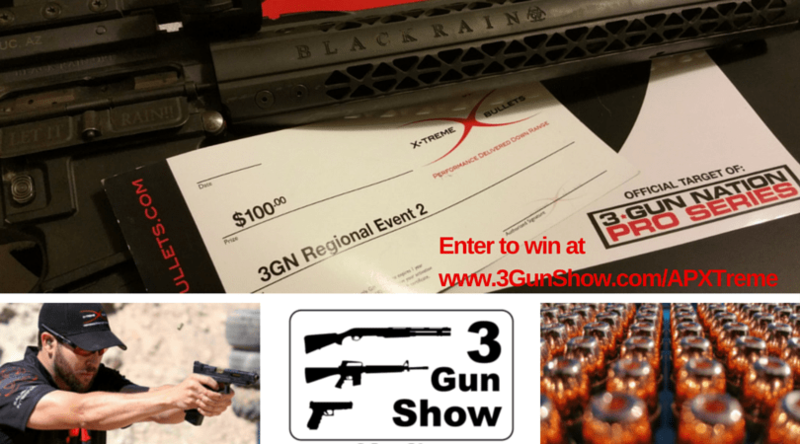 Sign up for the newsletter so you don’t miss out on awesome giveaways from the 3-Gun Show! Andy Peterson hit me up because he wanted to do a giveaway in conjunction with his interview on The 3-Gun Show. Of course I said yes! Andy is a shooter, he works hard to be as good as he can be and he believes in giving back to the sport he loves. Also, he’s a loyal listener of the 3-Gun Show. All this means that he wants to give you a $100 certificate to one of his biggest supporting sponsors, X-Treme Bullets, so you can load up some awesome practice or match ammo to help accelerate your game. Listen to Episode 14 featuring Andy Peterson and get the answer to the trivia question. Go to your email box and confirm the response. Your name will be tossed in the hat for the $100 certificate. This contest is open only one week so next Tuesday June 2 at 11:59 MST we will be shutting the contest down. On Wednesday the 3rd Andy and I will draw a winner and announce it on our Facebook pages. You don’t have much time so hurry up and enter!